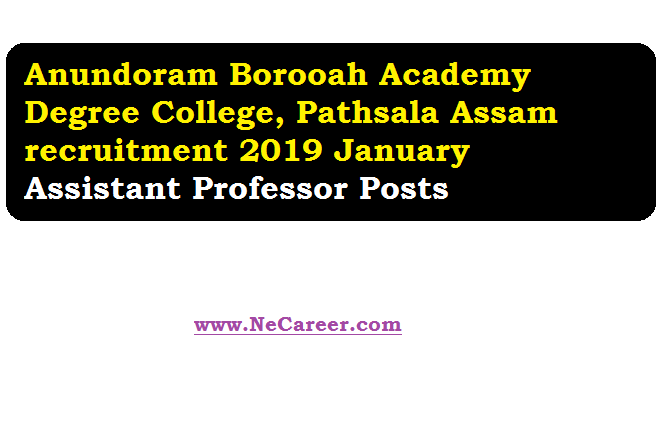 Anundoram Borooah Academy Degree College, Pathsala Assam recruitment 2019 January :- Welcome job aspirants.You are visiting North East India's No. 1 Job Portal www.NeCareer.com . Today we will inform you about a latest vacancy in Anundoram Borooah Academy Degree college, in Assam state. 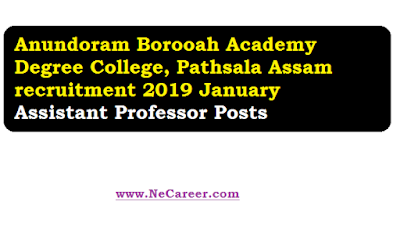 According to the recruitment notification 2019, Anundoram Borooah Academy Degree College, Pathsala invites applications from the eligible candidates for the post of Assistant Professor in Accountancy an management. The details of the vacancy is mentioned in below sections. Candidates must have the desired degree. Preference will be given to the candidates having M.Phil/Ph.D/NET/SLET. Interested and eligible Candidates may send their application. The applications should be supported by all testimonials, detailed resume and a Bank Draft for Rs. 1000/- (Non- refundable) in favour of Principal, Anundoram Borooah Academy Degree College, Pathsala and reach the office of the undersigned on or before 15th March, 2019, by registered post.Address : Sd/- Principal Anundoram Borooah Academy Degree College Pathsala, Barpeta, Assam PIN - 781325 The date and time of interview will be intimated later on. No TA & DA will be admissible.